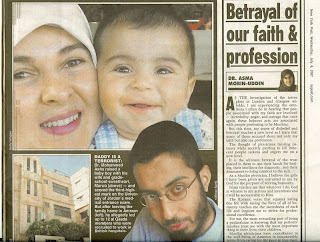 "Doctor Evil" as some British newspapers dubbed Mohammad Asha, has been acquitted by the UK courts & set free! I hope the British media would clear his image just like it associated it with terrorism. Mohammad & I went to the same Jubilee high school in Jordan. He was few years younger than me. It's great that he's finally free. Too bad he had to waste more than a year of his promising life waiting in custody. Googling Asha, yours was the first page that mentioned his innocence in the results. 4th in order, not bad. I talked about this in my journal yesterday too, but in locked mode. Maybe I should make it public. Thank you for all the links. god showed the whole wolrd the truth.. mohammad is a sample of good believer doctor and human. may god reward him for his patience.